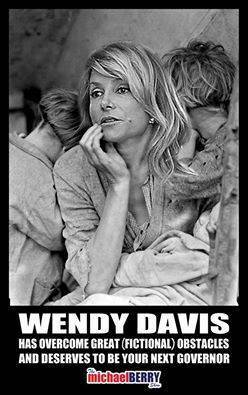 It’s obvious what is happening within the Texas gubernatorial race and Democrat candidate Wendy Davis. Sunlight upon the “real” life story of Ms. Davis has shown her life story narrative was foundationally false, so now she is obfuscating and trying to find niche issues which will afford her some electoral support. Davis has said she supports expanding gun rights in Texas. But in a statement to The Associated Press, she said that includes open-carry — a position that puts her at odds with her own party but could keep her from alienating gun rights advocates in a deeply conservative state where the Second Amendment is sacrosanct. This is remarkable, the latest in a string of rightward moves that must have the more honest among Davis’s backers wondering why they’re bothering. Thus far, their candidate has: dropped from her website all mention of abortion, the very thing that made her famous; started to describe herself as “pro-life” in the vain hope that voters might not notice; and, worried at how she might be portrayed, taken to walking around campaign events carrying a shotgun and talking like Yosemite Sam. The policy shifts, too, have been remarkable. As her star fades and her numbers sting, Davis sounds more and more conservative, railing against state income taxes that would increase funding for public schools and promising to expand the areas in which residents could conceal-carry pistols.